Following from Office Systems, topics will include: minutes, budget cycle, municipal legislation, bylaws & resolutions, Memoranda of Understanding) MOUs/contracts/contribution agreements, proposals, preparing public meetings, obtaining quotes, understanding tendering, business documents, speaking and listening effectively and administering travel arrangements. This course covers the roles and responsibilities of a professional office administrator. Topics include: professionalism in the workplace, maintaining office files and filing systems, using office equipment (phones, faxes, photocopiers and computers). Fees: Registration Fees for all of the MTO's online courses will be 5 days, though the course is run over a 3-week period. This fee is currently set at $300 for municipal employees and most GN employees. This is the total cost for the course and all course materials. Participants will be given the opportunity to gain knowledge and skills to professionally represent themselves and their employers through creating, implementing, and maintaining communications systems and standards for the organization. 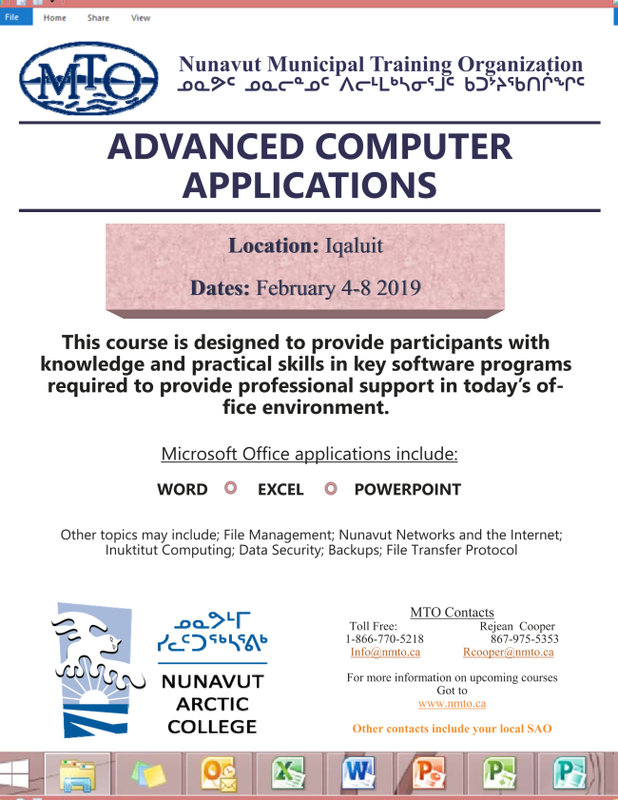 Designed to provide participants with knowledge and practical skills in key software programs required to provide professional support in today’s office environment. Topics will include: Word, Excel, Access, Email and internet usage, data security (backups), anti-virus systems. This course will provide the knowledge and skills required to ensure financial systems, day-to-day bookkeeping and accountability are maintained and supported.